The saw-wielding, flame-throwing robot uses Studio System parts that can withstand the demanding environment of the battle arena and adhere to the competition′s strict build timeline. 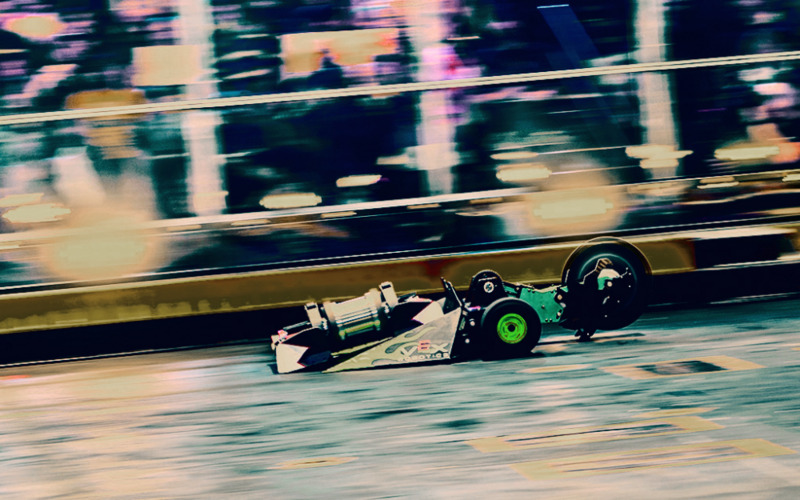 BattleBots® is a televised robot combat tournament that challenges teams of engineers from all over the world to design, build, and control a robot—demonstrating creativity, engineering skills, strategy, and driving ability. Each robot must be no more than 250 lbs with at least one independently-powered weapon. 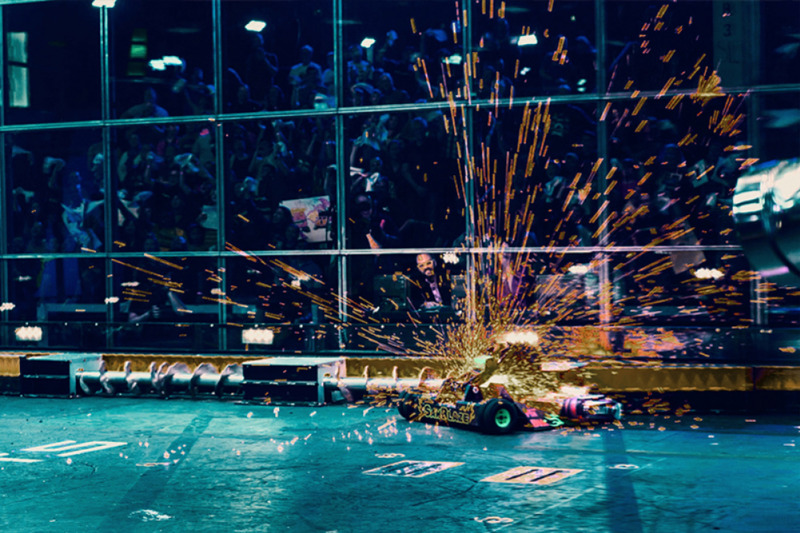 Robots fight in a closed arena surrounded by bullet-proof glass, going head-to-head to avoid elimination and get closer to the championship title. The design of each component is critical to the robot’s overall performance while the limited development timeline leaves little room for iteration. Comprised of MIT engineering students and graduates, Team SawBlaze is a Boston-based competitor whose robot’s weaponry includes a diamond abrasive rescue saw blade and flame-thrower. The blade is mounted to a controllable rotating arm that positions the saw at the front or back of the robot. This helps to stabilize the machine while enabling a bi-directional offensive. The flame-thrower emits green flames at 350°C in the direction of the saw’s target, delivering “slash and burn” blows to the opponent. The 2018 season featured the shortest build calendar ever, allowing just one month to build and ship the robot. Each component plays a critical role in the robot’s ability to perform, so the more design iterations the team is able to do before the final build, the better. Jamison Go, Mechanical Engineer at Desktop Metal and SawBlaze team captain, saw an opportunity to leverage the benefits of metal 3D printing with the Studio System—including design flexibility, rapid iteration in-house, high-performance materials, and reduced production costs—in order to spend more time fine-tuning custom parts for the robotic assembly. One of the key components of the SawBlaze robot is the backstop: a sub-assembly that straddles and protects the blade. As various loads are applied during battle, the backstop must demonstrate stiffness, strength, hardness, corrosion resistance, and heat resistance. As a structural component, it must be able to resist bending and lateral motion while being as lightweight as possible. The team considered multiple fabrication processes to print the two end pieces that would be later assembled with the metal cross-bar. With a limited timeframe and budget, the fabrication method is an important consideration—particularly for custom parts like the backstop. The cost and lead time introduced with third-party manufacturers leaves no room for iteration, while the design limitations of machining in-house would jeopardize part performance and introduce a significant opportunity cost due to the number of manual steps required. 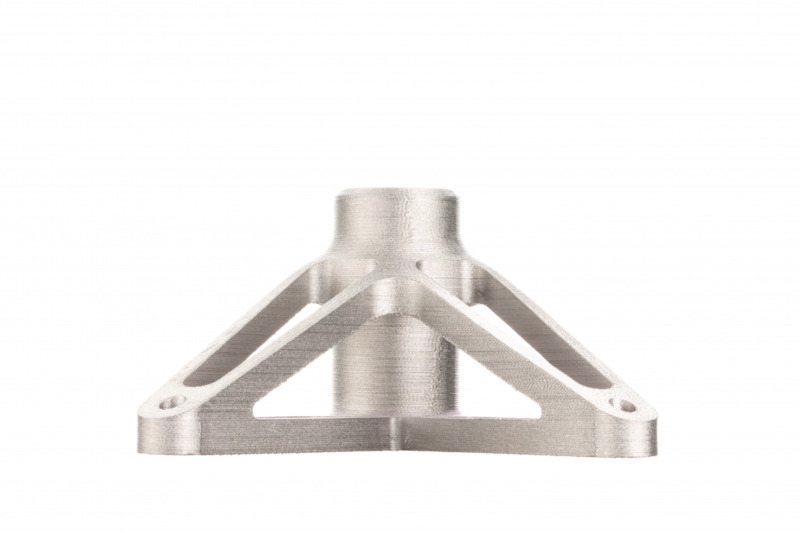 The challenge of achieving lightweight strength made the backstop an ideal candidate for metal 3D printing. The team designed the part with “cut-outs” and leveraged closed-cell infill throughout the part to eliminate excess material and reduce its weight in techniques that are impossible with other manufacturing methods. The two ends of the backstop were printed in AISI 4140 low-alloy steel with the Studio System and then fastened to each end of a metal cross-bar. 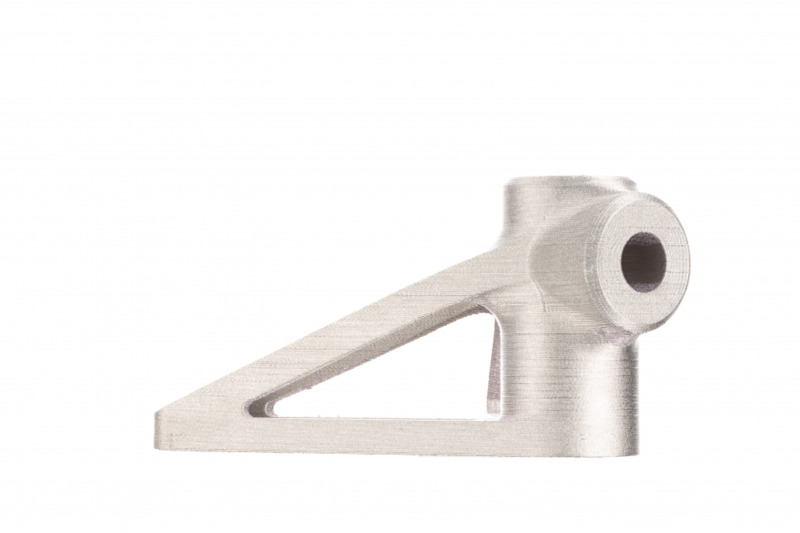 Achieving a 90-95% reduction in part cost and reducing the part’s weight, the SawBlaze team was able to leverage the benefits of in-house metal 3D printing process to produce a strong part that is ready for the arena. Throughout the tournament, the Studio System-printed backstop functioned flawlessly, withstanding repeated and varying stresses without failure. 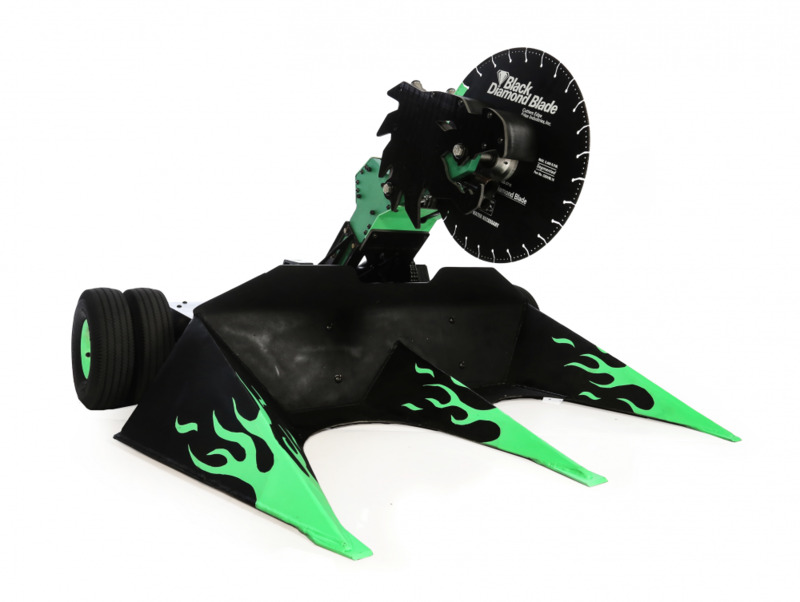 SawBlaze successfully fought and won multiple battles—its first victory: a knockout in just 94 seconds.